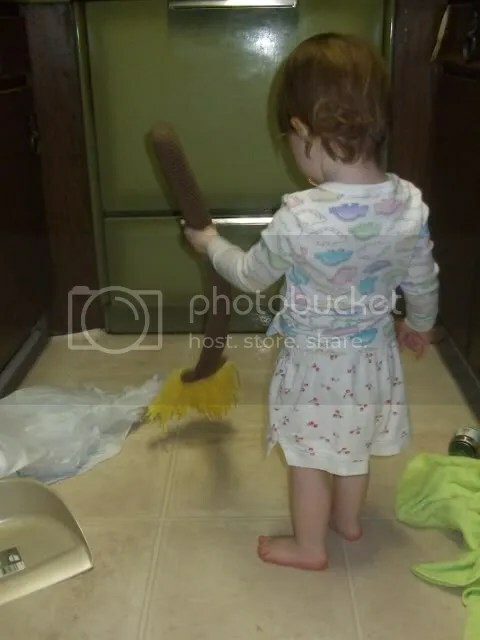 I made it a priority to make her a broom. My first non-food item! 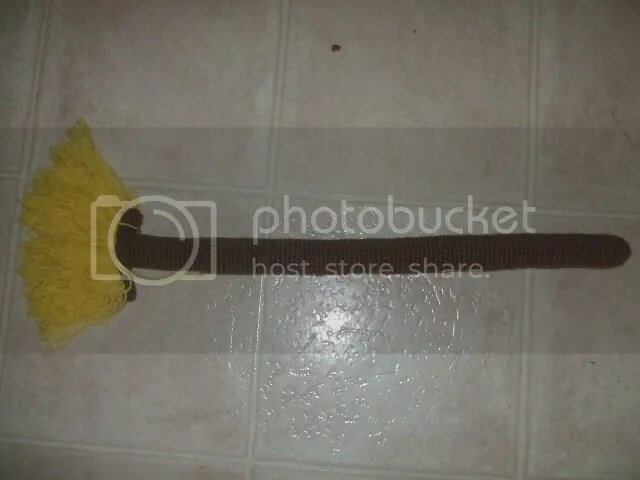 There are several issues with making a crocheted and stuffed broom. It’s pretty floppy (you could crochet and stuff around a piece of dowel) and the “bristles” aren’t stiff (I looked into it, but I wasn’t sure how to individually stiffen each piece of yarn without them being crooked or stuck together- I’m sure there’s a way, though) and it really looks kind of like a giant paintbrush… But it’s a broom for a toddler and it’s WAY less dangerous than my broom. I used worsted weight in medium brown and sport weight in yellow. Not crocheted at all. 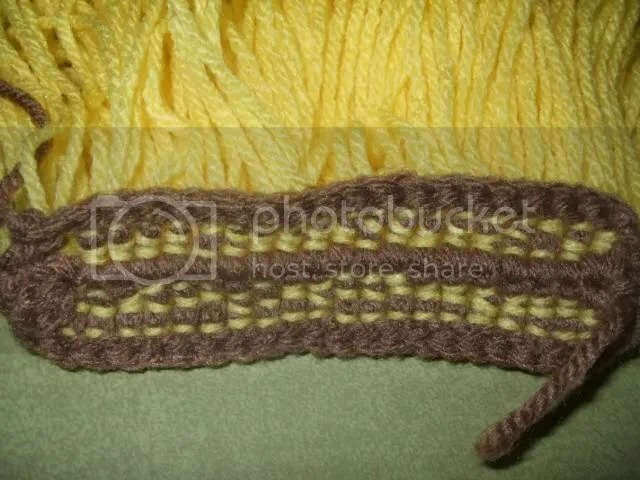 Cut 120 lengths of yellow yarn that are twice as long as you want the bristles to be. Mine are about 11 inches long. Take a length of yarn for the bristles and loop it around the back of one of the posts of dc in the broom base. Make sure both sides of the yarn are even and tie a knot. Tie three lengths of yarn onto the post of each dc, excluding the three dc at each end. The back will look like this. Sew the two broom bases together, then sew the broom handle into the center of the top broom base. This entry was posted in Free Crochet Pattern. Bookmark the permalink. Adorable! What a great training tool. You can buy stiffener in the craft store that would stiffen the "bristles" until they are washed. Or use laundry starch! Thanks! 😀 I looked up stiffening methods but I was worried that to stiffen each strand individually, I'd have to bend them at a funny angle or everything would all stick together.